Remove Duplicate Files from your Mac. Save Gigabytes of Hard Drive Space! 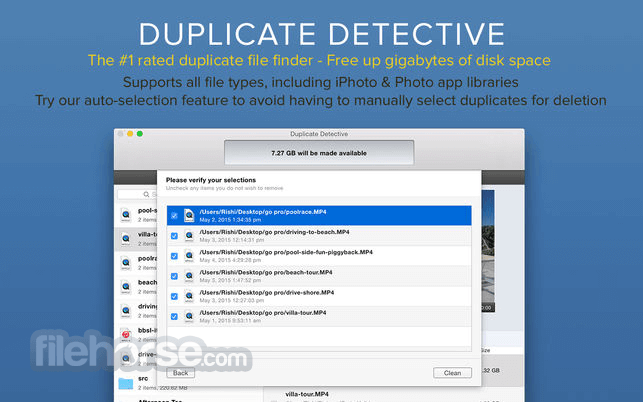 Duplicate Detective for Mac is the most comprehensive duplicate finder for your Mac. 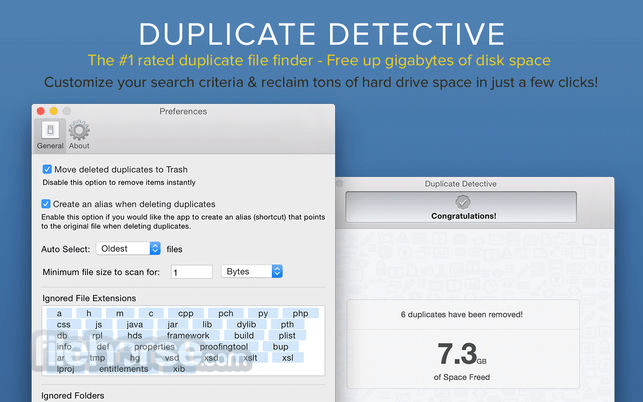 It quickly scans your hard drive to find all the duplicate files and folders on your Mac. You can then selectively choose which duplicates to delete and free up precious space on your hard drive. Remove Duplicate Files from your Mac. Save Gigabytes of Hard Drive Space! Download Now! Files are compared using our proprietary algorithm. This allows for accurate and fast duplicate detection. The app will locate duplicate files of any kind, including: images, audio and video files, archives, folders and much more. With its auto-selection feature, the app is able to instantly select all matching duplicates, helping with speedy removal of large batches of files and folders. As an added safety precaution, we have also added a confirmation screen to allow you to verify the files that will be removed. Filter & sort duplicates depending on their type, size, name, date and more. Also, you can choose how intensive the scanning process is by either reducing or increase the minimum duplicate file size value via the app's preferences. 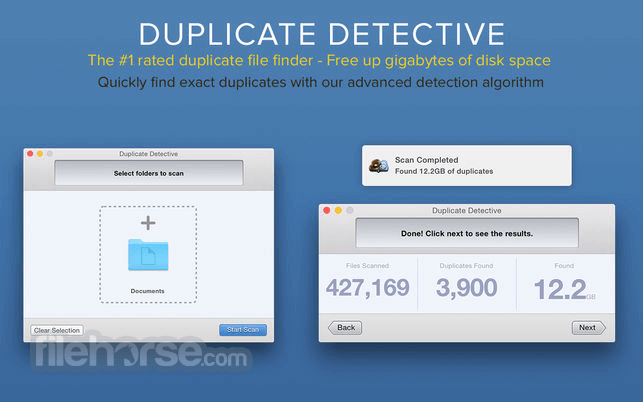 With its retina-ready graphics, Duplicate Detective is a joy to navigate and is simple to use. The app can scan your hard drive, USB keys, network volumes and much more. Free up gigabytes of disk space by removing potentially thousands of duplicates that are cluttering up your Mac! Note: Deleting files is disabled. Requires 64-bit processor.